Stott notes that we must listen to the voices of the world in order to be able to “respond to them sensitively though without compromise” (12). The church should transform secular space, rejecting the sacred-secular divide. Later in the book Stott picks this idea back up by asking the question: Will Christians be able to influence the secular world so that the values and standards of the kingdom of God will permeate their communities? Stott rightly notes that Christians cannot be utopians. A point that modern Christians often leave out of the missional equation. He also charges that while Christians are spiritually and morally distinct, they are not to be separatists. Stott writes: “…the influence of Christians on society is intended by Jesus to be both negative (checking the spread of evil) and positive (promoting the spread of truth and goodness, and especially the gospel)” (133). 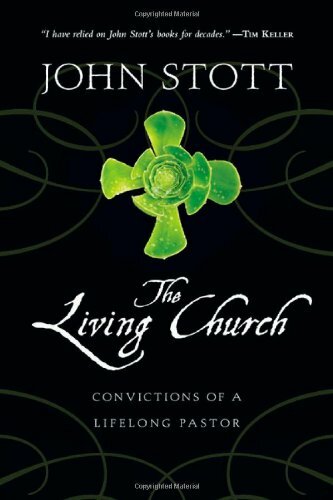 Stott’s threefold common commitment for the local church is helpful – to the church, its mission, and its renewal (see pages 19-21). Moreover, his explanation of God’s vision for the church as a learning church, a caring church, a worshiping church, and a evangelizing church are good categorical marks (The second appendix of Mark Dever’s book 9 Marks of a Healthy Church titled “The Numerical Nineties and Beyond” has several lists that are similar.) Both of these explanations would be helpful for training church members and outlining the ministry of the church for potential church members. With all of the worship wars being fought in local congregations Stott’s explanation of worship as a response to biblical revelation is simply refreshing. “Since our worship is a response to God’s word, its mood must be modulated according to the nature of the truth being expounded” (37). Moreover, he argues that the biblical content of hymns and songs is essential for Christian worship. The concept of liturgy and gospel worship patterns is something of interest here. But Stott keeps to the basics, he argues that every Christian congregation is called by God to be a worshipping and witnessing community. “If we truly worship God, acknowledging and adoring his infinite worth, we find ourselves impelled to make him know to others, in order that they may worship him too. Thus worship leads to witness, and witness in its turn to worship, in a perpetual cycle” (49). Stott’s words for programmatic churches are poignant. “Some zealous churches organize and overfull program of church based activities. Something is arranged for every night of the week…But such a crowded, church-centered program, admirable as it may look at first sight, has many drawbacks and dangers” (56). He then argues that programmatic churches can be detrimental to family life, it inhibits church members from getting involved in the local community, and it often leads to the structure becoming an end in itself not a means of ministering to the lost. The central question is this, do we imprison our members in the church? Here is a good word from Stott on theological controversy: “theological controversy is always distasteful to sensitive Christian spirits. Woe to us who enjoy it! But we cannot conscientiously avoid it” (82). Lastly, it was helpful to hear Stott comment on the idea of community, a hot topic in evangelical Christianity at the moment. He begins by acknowledging that there is a basic human need for community that comes from deep within our souls. We read in Genesis 2:18 that it is not good for man to be alone. This proclamation has been seen throughout church history to stretch beyond the marriage relationship. Stott notes that “…this basic, biblically recognized need is not completely met by Sunday churchgoing, or even the larger midweek meetings of the church” (87) He continues by stating that it is not an “exaggeration to say, therefore, that small groups…are indispensable for our growth into spiritual maturity” (87) . In these smaller groups we are able to find deep community where we share together, serve together, and care for one another.